Yes, as far as I can tell. Historical debt interest payments are not so easy to find. 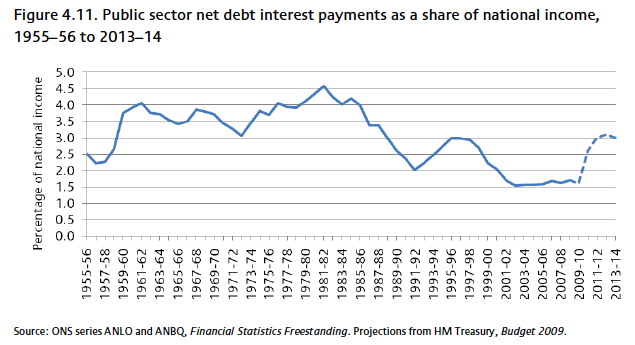 But, In 2010-11, debt interest payments were £44bn or 3% of GDP. A few months ago I spent considerable time researching and found these statistics. The ONS said they don’t produce statistics. HM Treasury publish data, but it’s not easy to find – usually hidden away. More at Debt interest payments. Why is it cheap to service debt despite rise in government borrowing? Increase in demand for government bonds seen as a relatively safe investment – safe compared to more risky private sector investment. Process of quantitative easing. Central bank creating money to purchase bonds has pushed up the price of bonds and yields lower. UK bonds seen relatively safe compared to the government bonds of countries in the Eurozone. 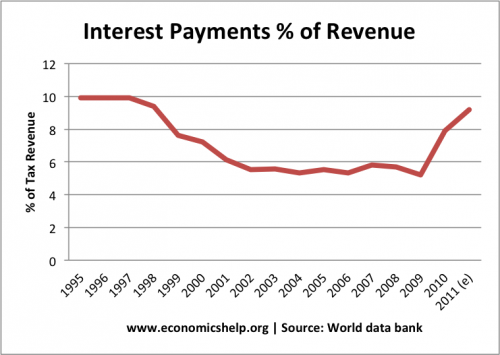 Another interesting statistic is the interest payments as a % of tax revenue, produced by the World Bank.. This has risen in 2010 and 2011 as tax revenues has stagnated and borrowing increased. 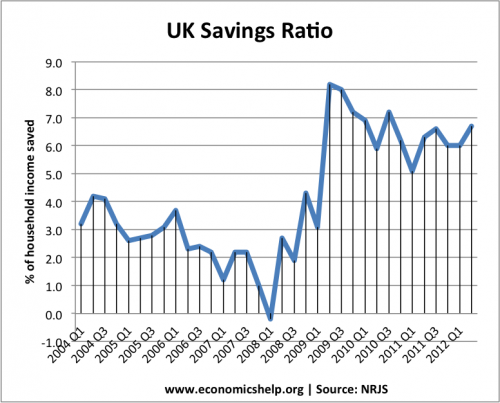 Why has the cost of servicing UK debt remained low? Re the “percentage of UK GDP which went to servicing debt” (2.5 to 3%), I assume this is before adjusting for inflation. 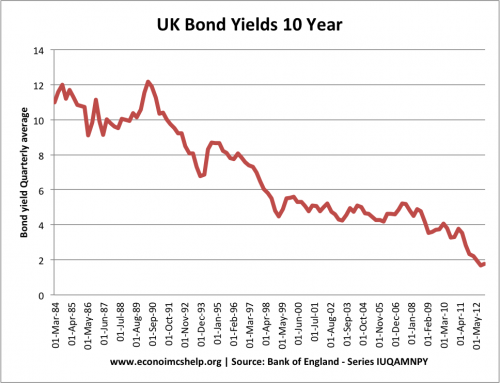 If inflation is taken into account, the REAL RATE OF INTEREST that the UK government pays on its debt is about zero.